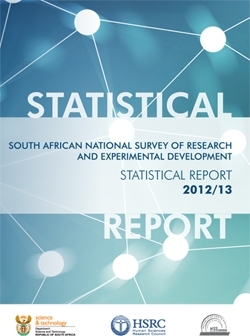 The latest R&D survey shows that South Africa spent R23.871 billion on research and development (R&D) in 2012/13. In nominal terms, this is 7.5% more than R22.209 billion reported in 2011/12. The survey covers the R&D performed within South Africa by five sectors, namely: the government, science councils, higher educational institutions, business enterprises, and not-for-profit organisations. According to the Frascati Manual, an internationally accepted guideline for measuring R&D, the collective name for R&D expenditure across all these sectors is gross domestic expenditure on research and development (GERD). The data reported in the R&D survey 2012/13 shows that for two consecutive years, GERD has increased. When these figures are adjusted for inflation (i.e. estimates in 2005 constant rand terms), GERD increased by 2,6% between 2011/12 and 2012/13. These results show that the outlook for R&D investment in the country has been improved, which is a welcomed change from the contraction reported in the 2009/10 and 2010/11 survey years. Survey results report that all R&D-performing sectors (government, science councils, higher education institutions, business enterprises, and not-for-profit organisations) registered an increase in R&D expenditure in 2012/13, in both nominal and real terms. The largest reported increase arose from the higher education sector, which grew at 5.9% in real terms and accounted for 67.9% of the total increase. For comparative purposes, national R&D expenditure is often expressed as a ratio of total size of the economy. This is known as the GERD ratio and computes GERD as a percentage of Gross Domestic Product (GDP). In 2012/13, the GERD ratio was at 0,76% of GDP; this level has been maintained for the 2011/12 and 2010/11 survey years. There is a common benchmark of a GERD ratio of 1% and for the last three periods covered by this report; this indicator has not reached this level. This suggests that South Africa needs to intensify efforts to direct investment spending to R&D across all sectors. Viewed over the longer term: for the sixteen year period (1997/98 - 2012/13), South Africa's investment efforts in R&D have been laudable and have expanded. This expansion can be attributed to the implementation of the 1996 White Paper on Science and Technology, the 2002 National Research and Development Strategy, and the Ten-Year Innovation Plan for South Africa (2008-2018). These strategic frameworks have purposefully guided the government in steadily increasing its funding for R&D over time, understanding that achieving substantive technical progress requires long term government commitment. By continuing to invest in R&D despite the pressures on the fiscus, during and after the period of the economic crisis, the government has sent important signals about its commitment to making South Africa a competitive nation. In the period before 2009, average annual increases in GERD, outpaced increases in GDP. Since then, this has not been the case. Part of the slowdown in R&D activity, reported by the R&D survey, was related to the negative effects of the global economic crisis on R&D investments, notably in the business sector. Indications are that, while the business sector remains the largest performer of R&D in the country, the recovery in its R&D spending is still lagging. There is a clear signal that mechanisms for encouraging business sector R&D need to be strengthened. The survey findings show that there has been an overall increase in total R&D personnel headcount, driven largely by the increase in the number of researchers in the higher education sector. Total headcount of R&D personnel grew from 59 487 in 2011/12 to 64 917 in 2012/13. This is an increase of 5 430 (or 9,1%). In 2012/13, the higher education sector contributed the most (2 048 or 37,7%) to the recorded increase in R&D personnel with the largest contribution (1 962) consisting of researchers. Researchers have always accounted for the bulk of R&D personnel. In 2012/13, researchers accounted for 66,0% (or 42 828) of total headcount, with the technicians and other R&D personnel making up the remainder. The ratio of full-time equivalent researchers per 1 000 employed was 1,5 in 2012/13. This ratio has remained between 1,4 to 1,5 since 2005/06, largely owing to a slower increase in researcher employment than in total employment in the economy. The growth in headcount of women researchers has been impressive; in 2012/13 female researchers accounted for 43.7% of total. This reinforces South Africa’s position as one of the leaders globally in terms of proportion of women in the total researcher workforce. International comparisons indicate that South Africa seems to have followed the general global pattern for slow recovery of R&D expenditure. South Africa's real increase of 2,6% in GERD between 2011 and 2012 is comparable to the real increase of 2,7% reported for all Organisation for Economic Cooperation and Development (OECD) members for the year 2012 (latest available estimates) and is better than the 0,6% average for the 27 European Union members over the same period. Different economic contexts must be taken into account when interpreting these international comparisons. Global R&D spending is still concentrated in specific regions, with 10 countries accounting for 80% of total spending. South Africa contributes about 0,4% of the estimated US$1.4 billion in global R&D spending. Although, it is a relatively small contributor to overall global R&D expenditure, South Africa is ahead of many developing countries in terms of absolute investment in R&D and R&D intensity (as measured by the GERD ratio). The government is of the view that South Africa still needs to intensify its R&D efforts to a more competitive level in order to meet its objectives of shifting to a knowledge-intensive economy and to meet the triple challenges identified in the national development plan. If South Africa benchmarks its performance against the other four countries in the BRICS arrangement, the requirements to intensify efforts are clear. The other BRICS countries are within the top 10 of the R&D spending nations, namely China, Russian Federation, India and Brazil. These countries have become hubs for global R&D expenditure and over the last decade have attracted more incoming international R&D investment than South Africa. There is a shifting landscape of global R&D in favour of developing countries with several BRICS countries featuring prominently. The various international partnerships that South Africa is pursuing are important to position the country amongst the leading nations in terms of scientific advances and investment in R&D. The information provided by the R&D survey is important in assessing trends and patterns of R&D investment. These data can be used to inform science, technology and innovation policies and national development planning. The National Development Plan (NDP) acknowledges that economic development is a long-term project. Adequate and appropriate investment in R&D is required to carry out Government's Programme of Action and achieve its objectives and key targets. The Medium Term Strategic Framework (2014-2019), therefore, includes a policy target that GERD be increased to 1,5% of GDP in order to support growth and development. To achieve this, three progressive phases and scenarios under which the contribution of R&D and innovation are expected to grow in importance over time have been identified and these will be used to inform the review and align current strategies. The Centre for Science Technology and Innovation Indicators (CeSTII) at the Human Sciences Research Council (HSRC) has now generated long term time series data on R&D investment, trends and patterns and therefore serves as an important component of evidence-based policy making in this country. The information provided by the R&D Survey is important in assessing the impact of science, technology and innovation policies and in informing national planning. This seminar provided a platform for knowledge exchange among academics, policymakers, civil society, think-tanks and the business community.